Glendale, Arizona may offer a sunny oasis through much of the year, but it is prone to heavy rains and winds particularly during the monsoon season, which batter homes and businesses. Your roof can take a beating during the monsoon season, leaving you with costly repairs when all is said and done. Regular roof maintenance and inspections will ensure that your roof is strong and healthy before the start of the storm season. You should get a yearly roof inspection, ideally before the start of the rainy season. The Glendale roofer will look for signs of damage or weakness on your roof, such as peeling shingles, loose tiles, or loose flashing. With the inspection, the roofer can identify these potential problems and make necessary roof repairs before the rainy season begins, so that your roof is ready to withstand the heavy rains and winds. If you have a foam roof, your roof maintenance should also include regular sealing to maintain the roof’s strength and waterproofing properties. Something as simple as a loose shingle can lead to major damage during a heavy rain. The shingle can tear away, creating a large opening for water to get under the roofing materials and into your home. You could wind up with widespread damage, rotting wood, and more. By getting your roof repair in Glendale performed promptly, you can ensure that your roof is ready to withstand whatever the storms have to throw at it. Trees and brush around your home contribute to the danger in a heavy storm. A good wind can snap branches right off trees and cause them to crash through your roof. Even smaller branches can be sent flying through the air and onto your roof. Minimize the danger to your home by trimming any branches hanging over your roof and eliminating excess brush around your home. Trim bushes and pick up branches and large sticks. Keep trees back from your home if possible. The trees might offer some nice shade, but they can also be a big risk if they are too close to your home. When the rains start, they may seem like they’ll never stop. You’ll see a lot of rain water flowing around your home. If your gutters are working properly, all that rain water will flow off your roof, through the gutters, and away from your house. If your gutters are clogged with leaves and other debris, the water will pour over the side and pool around your home’s foundation. In some cases, the water will be pushed back up onto your roof, allowing water to get under the roofing materials, into the attic space, and into your walls. You should clean your gutters regularly to make sure they are working properly. Be sure to clean your gutters just before the rainy season so that they are ready to meet the intense demands about to be placed on them. Being a little proactive before the rain season starts can help you save yourself a lot of headache later. You’ll also save yourself a lot of money on roof repair and even potential re-roofing. A healthy roof will protect your home from damage, so make sure your roof is ready before the storms start. 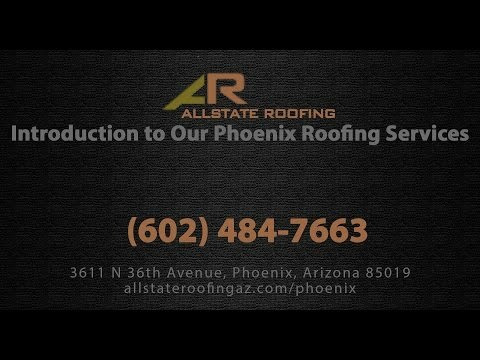 Allstate Roofing can help you get your roof ready for the Glendale, Arizona storm season. We provide ongoing roof maintenance and inspections, as well as roof repair and re-roofing services. We are a top-rated roofing company in Glendale, Phoenix, Peoria and the surrounding areas. We are committed to providing the best customer service and the best workmanship. We want your roof to be strong and healthy, not just for the monsoon season, but for life. Call us today to get an inspection or to schedule repairs. We’ll help you identify some key changes that need to be made, or we’ll recommend a better roofing system to protect your home or business.